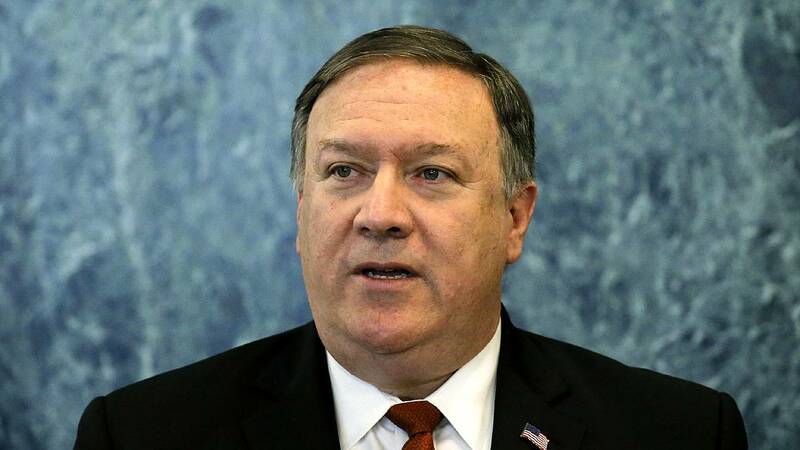 WASHINGTON (CNN) - Secretary of State Mike Pompeo blasted his predecessor John Kerry for "unseemly and unprecedented" behavior after Kerry said he had met Iranian officials since leaving office. During interviews to promote his new book, Kerry told an interviewer that he has met with Iranian Foreign Minister Javad Zarif three or four times since leaving office and that their talks touched on the international nuclear agreement, to which Iran, the EU, Russia and China still adhere. Kerry, who developed a relationship with Zarif over the course of years-long negotiations for the Iran nuclear deal, has publicly criticized Trump's decision to walk away from the deal without a replacement. In a Sept. 9 interview with CNN's Fareed Zakaria, Kerry said the withdrawal was "a very dangerous and ill-advised move that is not based on any broad strategy that is drawing other countries to the table to be supportive of it. Rather, I think it represents a campaign promise made by the President ... which has no basis in achieving the goals the President has set out, if there are goals." On Thursday, Trump tweeted that Kerry's meetings were "illegal." "John Kerry had illegal meetings with the very hostile Iranian Regime, which can only serve to undercut our great work to the detriment of the American people," Trump tweeted. "He told them to wait out the Trump Administration!" Asked if he thought Kerry's meeting had been illegal, Pompeo said he would leave the "legal determinations to others." He added that, "actively undermining US policy as a former secretary of state is literally unheard of." After Donald Trump's election but before he became president and took office, his transition team was accused of reaching out to the governments of both Israel and Russia to undermine Obama administration policies.